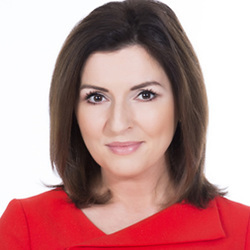 Colette is Virgin Media One's Main News Anchor where she presents the channel's flagship weekday news bulletins, The 12.30 and The 5.30. She joined Pat Kenny co-hosting the first series of Pat Kenny Tonight before returning to her full time role on Virgin Media One. In addition to anchoring the daily news, Colette has presented a number of special live news programmes including the first live television leader’s debate for election 2016. She’s also presented special programmes on election and referendum results, the State visits of Barak Obama and Queen Elizabeth II. She has also reported on location from a number of major world events including the disappearance of Madeline McCann in Portugal, from Sri Lanka in the aftermath of the Tsunami in 2004 and from Kashmir after the devastating earthquake in 2005.